On the afternoon of Sunday May 1st 2011, Victor and Sarah Crew hosted the first annual Folks & Crows Croquet Tournament at their house in Essex. The guests wore white, many a cravat was spotted, the lawn was mowed and the bar well-stocked beside it. Play began about 3.00pm and after a number of friendly encounters high tea was served. Play resumed after tea and the Wood family swung their mallets to victory, taking home the trophy after the formalities were complete. Congratulations to the winners and to Sarah and Victor for such a delightful afternoon. 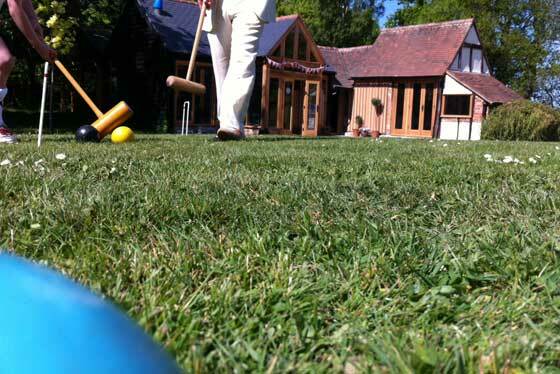 We will be practicing our croquet strategy and technique in preparation for next year’s competition. This entry was posted in Documentary and tagged friend, sports, spring. Bookmark the permalink.